Fall time to me is comfort food. Even more so than any other season. You always want those warm and delicious meals. That's why in our first #udisfallcomfort blog post, we posted about Amanda's chili recipe with gluten free garlic bread using Udi's gluten free baguette. 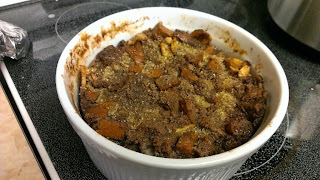 Today's recipe, a sweet warm dessert, gluten free bread pudding using one loaf of Udi's multigrain gluten free bread. I'll have to admit, although bread pudding is a fav of mine, this is not my recipe. Amanda's amazing mom who loves to experiment with gluten free baking, combined a bunch of recipes she found to make the perfect gluten free bread pudding into a chocolate banana bread pudding. She is such a talent, I had to share this recipe warm comforting gluten free recipe. Note before beginning: Make sure bread cubes are dry. If necessary, dry in the oven at 350 degrees. Using an electric mixer, beat the eggs until blended. Gradually add the sugar and bear until thick (1 to 2 minutes) to make your custard. Add vanilla and slowly add the cooled milk & chocolate mixture. Push bread down again so custard rises and bake another 15-20 minutes until custard is set. Top with confectioner sugar if presentation if you want.